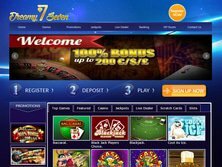 Dreamy Seven Casino's website is created in a unique manner. The design definitely sets it apart from the competition. The clear division of the games makes it easier navigate the site and make a choice in regard to the game that is to be launched. The quality entertainment focus (the stated goal of the whole project) is easily noticed when looking at the live dealer games. All the traditional games can be played with live dealers, which makes the whole casino experience seem all the more exciting. After the player clicks on the sign-up button, a little form appears. A few bits of information are required in order to begin. A player who drops the first deposit can be instantly credited with a free 100% welcome match bonus up to $/€/£200. The person who puts in $/€/£200 can get another $/€/£200 in return. This means that the chances of winning are essentially doubled. In terms of other Dreamy Seven Casino Bonus deals, the player can expect to find offers that are valid during particular times of the year. For example, a Thanksgiving deal is provided, which guarantees a 20% bonus up to $/€/£200. It requires a deposit of $/€/£20-50 and the application of the following code: THANKS. There is also a 35% bonus up to $/€/£200. This offer requires a bigger deposit of $/€/£51-150 and the code: WISHBONE. Lastly, a 50% bonus up to $/€/£200 is available with a deposit of $/€/£151 or more and the use of the code: TURKEY. On Mondays, it is also possible to take advantage of a deal which allows the player to double the money up to $/€/£50. The casino has even set up special surprise deals. They are offered on a weekly basis. Free spins and cashback offers are not excluded either. Lately, a $10 no deposit bonus has appeared on the site. There are a number of restricted territories. Here are just some of them; Belgium, Denmark, Estonia, Finland, France Germany, Greece, Portugal, Romania, United States of America, Turkey and Spain. There are also three supported currencies in which an account could be registered ($/€/£ ). This indicates that the casino is trying to reach a broad audience. At the same time, a definite focus on Europe can be observed. A wide variety of games have been presented as part of the popular game category, which shows the eclectic tastes of the players. The list of highlighted game would include; Crazy 80s, Cool Wolf, Cool Buck, Cashanova, Cash Clams, Booty Time, Candyland, Big Kahuna, Carnival Royal, Alice and the Red Queen, Alaskan Fishing, Asian Beauty, Big Top, Blackjack Players Choice Blackjack, Cool as Ice, Beer Fest, Big Break, Bunny Boiler, Bangkok Nights, Barber Shop, Around the World and a whole lot more. The website games can be divided into casino games, jackpots, live dealer games, scratch cards and slots. 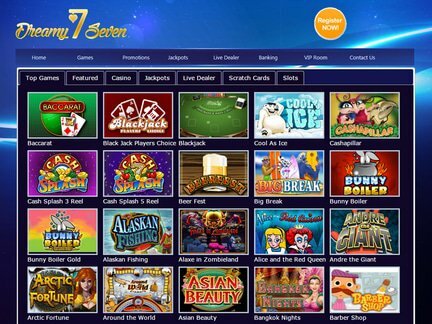 The presence of so many game categories makes it possible to find an ideal form of entertainment at Dreamy Seven Casino. The complaints do not show up in association with website. However, the high ratings from players are also absent. Therefore, the visitors must decide whether the website is worth their time. There are some factors that can always help in deciding such things. The customer support service and their responsiveness is something that should be looked into as part of the evaluation process. The website promises to answer any inquiries via e-mail and live help. The venue is operated by ProgressPlay Limited. A license was issued by two licensing bodies, mainly the Malta Gaming Authority and the UK Gambling Commission. These licensing bodies have gained a sufficiently good reputation to be a source of pride for the casino. Getting those type of licenses takes time and effort. The players can definitely appreciate the venue in that respect. When I entered the main site, I saw a good selection of games from Microgaming, a long-time provider of online casino entertainment. All the games were lined-up in such a way as to make it easier to pick a title. The fact that I could play live dealer games has been a joy. I also felt that the promotions section featured the kind of deals that would make me want to go back to the venue in the future. My experience with the customer support has likewise been encouraging. Thankfully, I don't have any complaints to pass along.